My weight has been a lifelong struggle & I was up to 246 lbs at one point. I’ve tried every diet and exercise program available. I lost a lot of weight & health following a low-carb diet. I became a Type II Diabetic with High Cholesterol, High Blood Pressure, severe Reflux, stomach ulcers, adrenal and thyroid tumors, insomnia, migraines, depression, anxiety & was constantly obsessed with food. Tired of being on 32 meds I wanted a change. I went vegan 3/‘13 @ 179.8 lbs. I lost some weight & regained some health, but wanted to be completely heart attack proof, no longer Diabetic, off ALL medications, and no longer struggle with food addictions. I started the Protective Diet (PD) on 11/30/13 @ 147.6 lbs. On 4/23/14, my total cholesterol is 111, my glucose is 82, and my weight is 128 lbs. On PD I have reached all of my health goals. I am free of my excess weight. I’m off all meds. I’m alert & happy. I’m active and physically strong. I sleep well. I’m pain free. My body and mind are healed from the constant thoughts of weight, diet & food addictions. I eat delicious food, love the recipes & enjoy cooking again. This is all thanks to PD. I feel more alive than ever and EVERY cell in my body is healthier. I want everyone to know PD is a real sustainable and enjoyable way to live healthy. 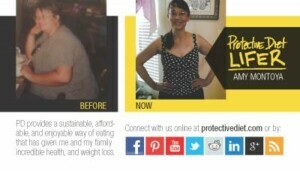 Get on Protectivediet.com, make a 30 day 100% commitment and your life will never be the same.